Until the 1820s tinder boxes were the best way of creating a spark to light fires. In 1827 an English chemist invented the first match; he realised that if he coated a piece of wood with a mixture of antimony sulphide, potassium chloride, gum and starch, he could strike the wood and a flame would be created by friction. 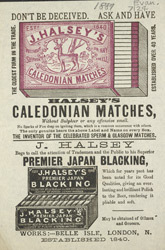 He dipped slithers of wood into the mixture coating just one end, he sold many of these matches supplying customers with small pieces of sandpaper to strike them on. He did not patent his invention and others like Samuel Jones, quickly took up his idea.